WebLink is included with most DonorPerfect systems. Simply click WebLink from the App Links menu. If this is your first time using WebLink, you’ll be asked for an email address for form administrative purposes. Note: If you don’t see WebLink listed, contact your Account Representative. Click Add WebLink Form at the bottom of the Review and Acceptance (RAC) screen. Pick a form template. Not sure which template to pick? Check out this chart on our sample donation website. Enter a name for your form. This is only for your internal use. You’ll create customized links to share with donors later. Are you accepting credit cards, checks or both? Choose a Payment Method for the form. If you haven’t done so already and you plan to accept online payments, activate your Merchant Account. Our team will walk you through the entire process in just a few minutes. 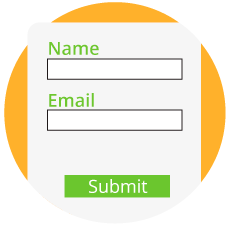 Enter an email address(es) to specify who should receive form activation information. 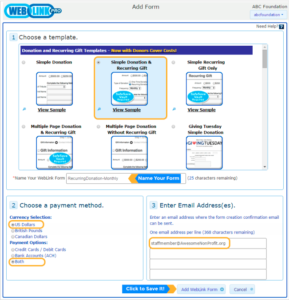 Click the Add WebLink Form button to finish adding the form. You’re now ready to customize your form. Want To See Us Create a Real Form? Watch This Video! For more information on creating WebLink forms, please visit Adding a WebLink Form in our Knowledgebase.